Acute Records dig really deep to bring us this LP from The Trypes, a band that emerged from the same New Jersey milieu as - and shared key members with - the mighty Feelies. It's stripped-down but beautifully arranged psychedelic pop delivered with a kind of post-punk sulkiness, peaking with the divine, Brenda Sauter-sung 'From The Morning Glories'. 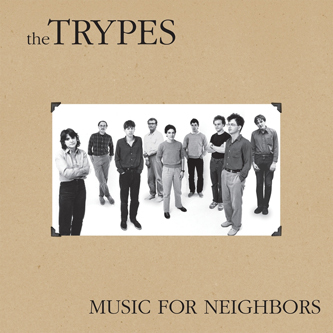 There are a lot of similarities to the Feelies - the tom-heavy, VU-worshipping drum parts, the jangly guitars, the irresistible hooks - but for the most part The Trypes' sound is a less urgent, more baroque and filigreed beast. Side A features the band's entire - slim - recorded output from 1984-85 (basically The Explorers Hold EP plus a compilation track) and Side B collects never before heard demos from the same period. We just can't enough of it, frankly; overnight The Trypes have become one of our favourite bands and we'd recommend them to fans of Young Marble Giants, Talking Heads, Felt, The Wake and other practitioners of the finest 80s art-pop.